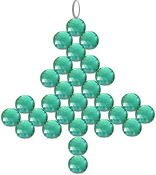 Use this free beaded Christmas tree pattern to make a tree pendant, or Christmas tree earrings, for yourself, or to give as a homemade gift to someone you love. And, of course, you can always hang these tiny trees on your big Christmas tree. Please note that the step-by-step graphics are illustrated with spaces between beads for a clearer direction; in the actual beading, there should be no spaces. Cut a piece of wire around 1 meter long. Add 4 crystals to the wire and cross both ends of the wire through the last added crystal, make sure you move the 4 crystals to the middle of the wire so that both ends of the wire are of the same length. Now add 1 crystal to each side of the wire, follow by adding a last crystal and cross both ends of the wire through this last added crystal. Remember to pull tight. Get the idea! now add 2 crystals on each end of the wires and loop back each end through the crystals from step 2 as shown. Remember to pull tight. This step is a bit trickier: add one crystal and cross both wires through this crystal, add one crystal on each side of the wire, then add one more to cross the wires through (like step 2). Now add one crystal and cross both wires through the crystals and repeat this again. You can end off by adding stop bead on each wire then cut off the excess or simply just loop the wires back through the piece as far up as you can go and cut away the excess. See More free Beading and Craft tutorials at: http://www.beadjewelrymaking.com under the Bead Project section! The above project was contributed by www.beadjewelrymaking.com with special permission, please do not duplicate without permission. It’s true that craft supplies are getting more expensive, but you can always find craft projects on the net that use recycled or inexpensive supplies. There are many examples on the Christmas section of this site, and many other great web sites as well.